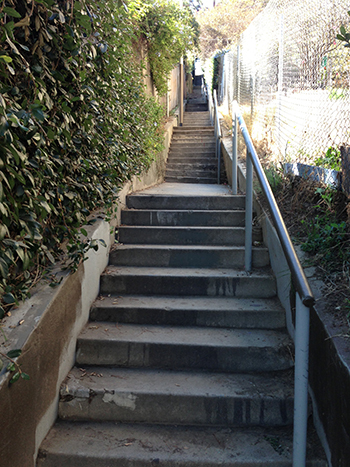 Summary: The day I checked out this stairwalk, I was greeted by the intoxicating (literally) scent of Urban Decay: eau de stale cigarettes, flat beer, and a potent dose o' urine. Around the base of the steps there were posters for "Antisocial Hollywood," and that about sums up this depressing climb. The steps themselves are cracked, crumbled, and very uneven -- which is the only thing that makes this stairwalk at all challenging.